Welcome to the BIPHOREP homepage. The BIPHOREP project (1996-98) was supported by the EC environment research programme. The main goal of the project was to understand better the biogenic emissions of volatile organic compounds (VOCs) over north European forest regions and to develop photochemical schemes for the estimation of their oxidation in the atmosphere, in particular for terpenes. Within BIPHOREP, the VOC emissions of boreal vegetation have been investigated at different levels, from leaf to regional, during intensive field campaigns in different boreal zones. The measurements have been coupled with emission and photochemical modeling in order to assess the importance of biogenic VOC species in photochemical processes and ozone formation. 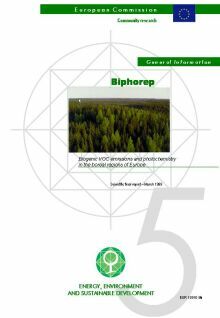 Biogenic VOC emissions and photochemistry in the boreal regions of Europe, Edited by Tuomas Laurila and Virpi Lindfors, Air pollution research report No 70, Commission of the European Communities, Luxembourg, 1999. 158 pp. ISBN 92-828-6990-3. The report can be viewed or downloaded in pdf-form. Click the image on left to access the contents. Publications arising from the project (Articles and extended abstracts).